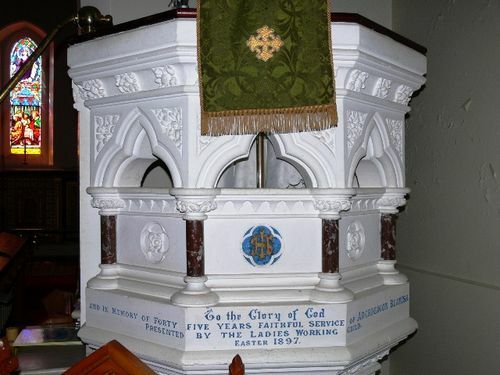 The pulpit in the church commemorates forty-five years of service to the church by Archdeacon Beamis who died in 1914. In 1849, Dr. Beamish was appointed vicar of the parish of Warrnambool which then extended west to Hamilton and east to Geelong. He continues there as vicar for a period of 45 years, when he resigned on the advice of Dr Nettleford, his London oculist. In 1878 he was made Archbishop of Warrnambool by Biship Thornton, with jurisdiction over a considerable part of the Western district. He was the senior Anglican clergyman in Australia and the last surviving member of the first Church Assembly held in Australia. Excerpt from Australasian (Melbourne), 29 August 1914.